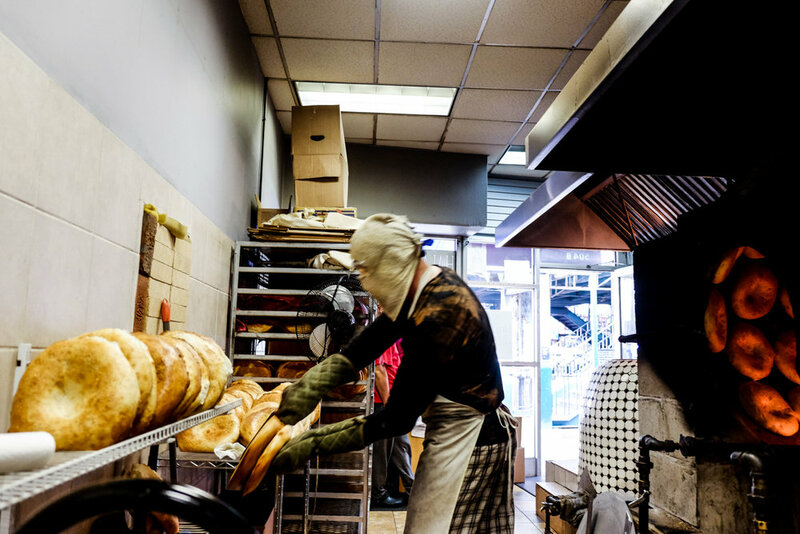 On a small stretch of Brighton Beach Avenue, just as you walk down the stairs from the Q train station, a man waits for you to order from a small bakery window. He stands next to a small black-and-white tiled tandoori oven and surveys the crowds that pass. There isn’t much room inside the bakery, but still there is a flurry of activity behind the calm exterior. This is Brighton Tandir Bakery, but you won’t see that on a sign anywhere unless you can read Russian. The only sign I can read says “Halal Samsa,” and displayed above the window are several photographs of small brown pastries and breads labeled with cyrillic words. The pastries are round, with one square and one triangle in the mix. They are all sprinkled with sesame and nigella seeds, there is no indication of what is inside. An enthusiastic patron tells you that this is “the real bakery,” and that the best bread in town is here; “the real bread,” she says. She tells you to try the samsa and suggests the lamb or the pumpkin, then goes about ordering in Russian. Jumping into action, the man in the window puts several round loaves of bread studded with sesame seeds into a bag. Samsa are traditional Uzbek pastries, made from layered dough typically filled with meat and a lot of onions and baked on the walls of coal-fired tandoori ovens. They are the cousins of samosas and are born of the need to eat and run—Uzbekistan sits in the middle of the Silk Road, and long-distance travelers have always needed a meal on the go. I can only guess what the signs mean, as the language barrier here is real. When I point to a pastry, the owner serving me says the name in Russian and tells me, “this is lamb, beef inside,” indicating the square samsa in the photo closest to me. There is another photo of three small pastry balls baked together, perfect for sharing or for little hands on the go. “Samsa. Lamb and beef inside,” he says again. I order the lamb and beef square and ask for one pumpkin samsa (I’ve got a hot tip from a local). He heads to the back of the bakery, past a round oven flickering orange from the burning coal inside, where workers donned with headscarves are plopping bread onto the side of the oven. They dance in and out of the heat, plucking fresh bread from the baking walls, washcloths draped over their faces with slits cut for their eyes so they can see. The owner notices I am watching his workers. “Hot. Very hot,” he says with the pumpkin samsa in his hand. He places it in a brown paper bag, adds napkins, and charges me five dollars. The next person in line belts her order in Russian as I linger just a little too long. The square samsa promises hefty black pepper and onions folded into a generous amount of minced lamb and beef. It’s delicious and hot, and although the flavors are aggressive, the samsa feels approachable and not overly spiced. Juicy, meaty, oniony. 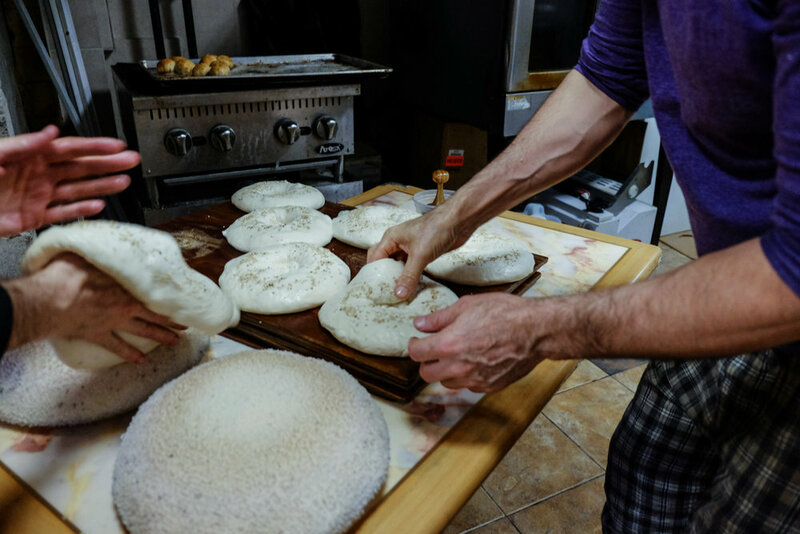 The dough is crisp on the outside and soft within; not too thick, and evenly stretched around the meat inside. The pumpkin samsa is luscious and silky. It is also laced with cooked onion, but is defined by the soft, yielding flesh of bright orange pumpkin and whole cumin seeds. The pumpkin is lighter than the meat samsa, but just as filling. It’s delightful. As you walk away from the bakery, eating a steaming samsa and people watching, you might forget that you’re in Brooklyn. Instead, for a moment, you’re making your way along the Silk Road.